179 p., 4 ill., 14,7 x 20,8 cm. With contributions by Hermann Beland, Friedrich-Wilhelm Eickhoff, Gerhard Fichtner, Lilli Gast, Ludger van Gisteren, Erika Krejci, Thomas Müller and Hanna Segal. This paper aims at analysing and conceptualizing the useful but also potentially harmful uses of counter-transference in clinical situations with the patient. The basis for an understanding of the mainly unconscious counter-transference in the complex transference/counter-transference situation is provided by projective identification as described by Bion in its various functions. Here, the author assumes a certain counter-transference disposition in the analyst enabling him or her on the one hand to be receptive for the patient’s projections, on the other hand to observe, consider and interpret this interaction. Clinical examples show to what degree counter-transference in this sense can function as a key to an understanding of the patient but can also be misleading when not based on observation of the material and the feelings of the patient. In order to assess the usefulness of the concept of death instinct some clinical and theoretical examples of Freud, Segal, Bion, Rosenfeld and the author are discussed. In short, it became clear that Freud’s third theory of the instincts is best understood if taken as basic information theory, dynamically open to the future. Its »fusions of instincts« and »defusions« first had to be detected and understood as they have to be clinically detected in the future. They were key concepts without content, tasks in itself. In Freud’s hypothesis about the beginnings of life as much as in his ideas about the future of mankind one can find the expression of a phenomenon which Hanna Segal described in one of her clinical examples: Under benign circumstances the confrontation with the death instinct mobilizes the life instinct. Clinical examples of Segal, Bion, Rosenfeld are discussed. Two main results of the discussion deserve mentioning: a discrimination of frustration aggression from unlimited auto-destruction after nameless dread. This annihilation dread activates the psychic death drives as attacks on linking. Frustration aggression, in contrast, belongs to the life instincts, is aggression in the service of development, averting premature death. Rosenfeld’s »destructive narcissism« is an example of »fusions of instinct«. His comparison of the organisation and intentions of destructive narcissism with the organisation and intentions of the German Nazi state organisation and intentions opens areas of understanding of collective destructiveness, as it opens perspectives of collective mental change. The author tries to identify the special place which thoughts on mourning had already held in Freud’s work prior to the fundamental paper Mourning and Melancholia, the contents of which are outlined. Further, he demonstrates the major influence of Freud on articles by Karl Abraham and Melanie Klein, who recognized his findings and arrived at alternative and above all additional insights which suggest a continuity of normal and pathological mourning and manic-depressive states. Moreover, several references are made to the relationship between mourning and insight and creativity, as well as to the possibility of applying Freud’s instruments to the analysis of collective processes, and finally to contemporary papers which are historically connected and which deal with mourning and the failure of mourning work respectively. This essay undertakes a re-lecture of Freud’s treatise On Negation. The main focus is placed on Freud’s theoretical and metapsychological exploration of thinking as it is set forth in his analysis of the development of different types of judgement. From here, the author elaborates on the role and function of the wish in its metapsychological significance in Freud’s œuvre and examines it within the dialectics of repression and thinking. In this introduction to Bion’s theory of thinking and his most important concepts I want to show the development of his conceptualisation of psychic phenomena in comparison with theories and concepts of Freud and Melanie Klein. In order to observe and reflect the dynamic events of the paranoid-schizoid modus in the consulting room and to transform them into a symbolic way of functioning in the depressive position, the analyst needs a refined theoretical equipment. Bion’s theory is meant as a support for the analyst to enable him to think about the emotionally charged encounter also beyond the linguistic exchange in the psychoanalytic situation itself. Freud’s theory of the psychoses is discussed with special regard to the topographic theory. 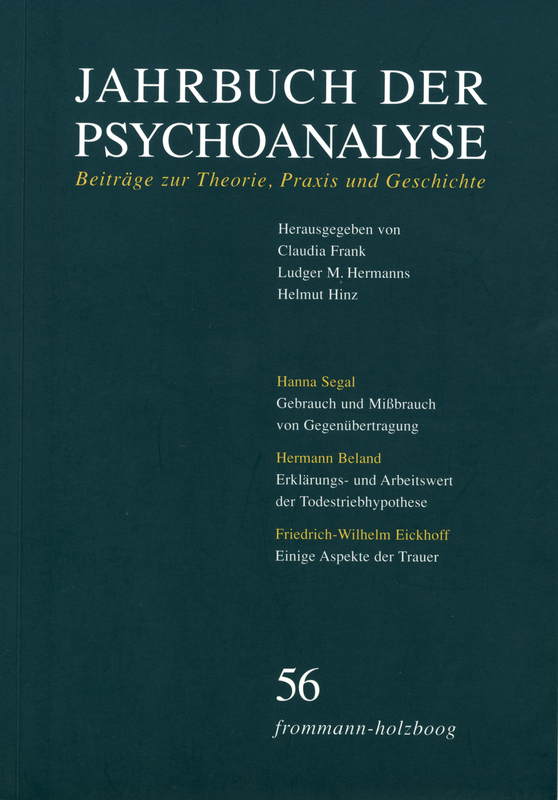 Though Freud did not present a consistent theory of the psychoses, he succeeded in formulating essential structural features of the psychoses. For psychoanalysis, the present dialogue with the neurosciences represents a seminal challenge. Freud still lacked the technical and methodological means of researching the neurobiological bases of the psyche. In the meantime, however, it has become possible to confirm essential elements of psychoanalytical theory with the results of empirical neuroscientific research. With the aid of modern, functional imaging methods (PET, MRT), locatable brain activities can now be observed directly in a wide range of psychic states and stages. As a consequence, the evidence of even the most finely differentiated sub-functions of psychic experience leads to ever more precise empirical descriptions and theoretical conceptualizations of the »psychic apparatus« as a highly complex interaction of psychic and physiological functions. In clinical and empirical process research it has proven possible to reconstruct the processes of transference and countertransference as the communication and re-creation of implicit knowledge of interpersonal relationships in the sense of an updating and reorganization of sub-conscious object dependencies.